This is my third Bloggers Quilt Festival and while I'm a bit late for this one, I am still very excited to share this tiny quilt with you. It is one of my most favourite things I've ever made (1) because it was inspired by one of my own photographs, and (2) it is made entirely from wool which was a new experience for me, and (3) it ended up being our 2010 Christmas card! I don't actually have this quilt. I made it for a mini-quilt swap on Flickr. I was very sad to see it go, but I had faith that it's new owner would love it as much as I do. The theme was "houses" and my partner is a major bird lover and well-known on Flickr for bird motifs in her work. Now, while this may not be the kind of thing you expect to see in a quilt festival, I can tell you it does have three layers, all joined together with some stitching, and it is bound as well. I created it without using any templates, just a sketch, some wool, sharp scissors, steam-a-seam lite, embroidery floss and my machine. 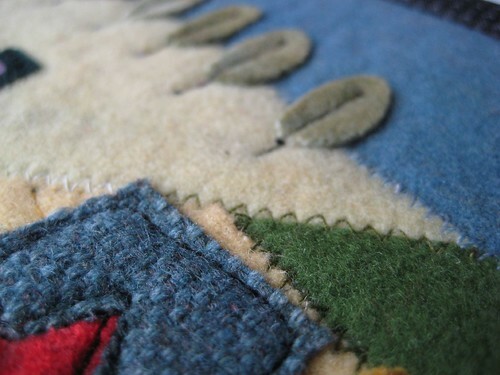 The large background wool areas were butted up to each other on a canvas foundation and top stitched together with a zigzag stitch. I free motion thread painted the grass over top of some spikey wool cuttings that I had fused on. 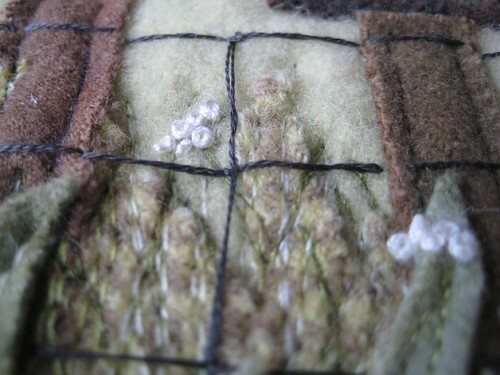 The Queen Ann's Lace are french knots and the fence wire is embroidery floss couched on with some stitches where the 'wires' cross. I think my favourite parts are the round bales of hay, though. Here is a picture of the whole mini complete with it's thicker-than-usual binding. Thank you for stopping by to visit Poppyprint in the festival (and thank you Amy for giving us the chance to meet so many new quilting friends through sharing our work!!) - I hope you'll come again soon! If your coffee/tea cup is empty, head for a refill and come on back to enjoy the rest of the festival right here. There are over 300 quilts entered already!!! My favorite post of the day. 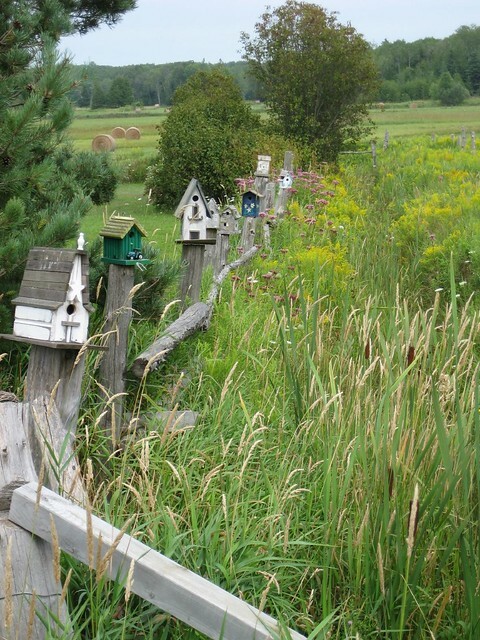 I just love the pictures of the bird houses on the vintage old post. And the quilt is perfect for indoor charm. I love the inspiration photo and I love your quilt. Just beautiful! It's beautiful and I'm sure the new owner loves it too! 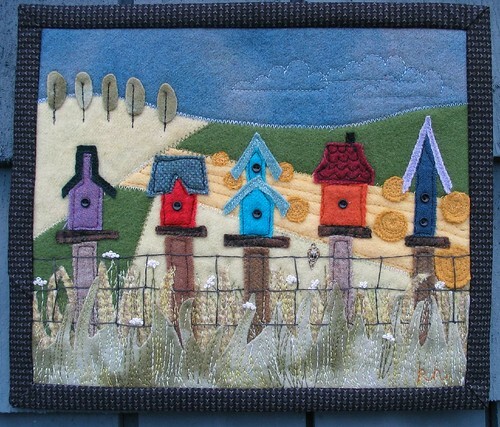 Such cuteness - love how you interpreted the picture into the mini quilt - love the wool. You should make a new one for yourself! What a lovely quilt! Really a work of art. And your photo is amazing. I love your quilt! It's is beautiful and unique! Very sweet. I love your inspiration photo too! Ohhh I love this! 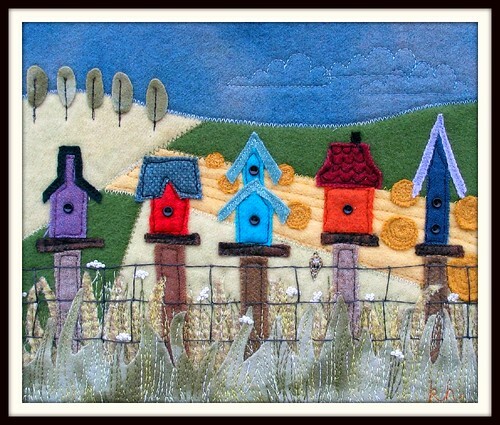 Funny how great minds think a like - I have a birdhouse art quilt inspired from a photo to http://ninamariesayre.blogspot.com/2009/06/birdhouses-and-lilies.html Thanks so much for showing how to work with the wool - that's on my to do list!! I never think about sharing a mini quilt for the quilt festival. I should do that next time since I make more of them! I am glad you shared this quilt. It's one of my favorite things of yours. You do the most clever designs... I love all your little touches you put on things. This one is no exception! Such the artisté! This is just fantastic. I can't believe you were able to let it go! Good choice for the show!! I LOVE, LOVE this little quilt...you should make it into a pattern!! It is a real work of art and a very lovely small quilt. I can see why you had a hard time letting it go. Oooh, I love it and thanks for sharing. The inspiration photo is a cool one too. you should be proud...its adorable! i love how you did the fence! That First photo was one I found when I did a search on Flickr for birdhouses( I just adore them!) thus introducing me to you and all your beautiful work...Keep it up, your Amazing! I agree- a real work of art! Birdhouses are a favourite of mine too! That little bird on the wire seems to be having trouble deciding among all those houses. I haven't got time today to visit blogs, and just stole a few minutes before going to a parent-teacher meeting, but this was the best choice to spend my 5 minutes online - your quilt is fabulous, wonderful! I love the photo too, and you found a great way to interpret the picture. really really lovely, congratulations!! What a gorgeous whimsical quilt! It is just incredible! I love this little quilt, Krista, and almost wish I had joined in on your mad swapping extravaganza for a chance to own it myself! Still love this little masterpiece! The Christmas card is in my box of things to love for a long time. This is so lovely and so charming! It's perfect! so cute and different from anything else at the festival. I love birdhouses too! Gorgeous! I love all the details. You did an amazing job and I'm sure the recipient will treasure it. That is amazing and if the swap partner loves it half as much as I do she is counting her blessings that you were her swap partner. I would have a hard time sending this quilt on to a swap partner too. I would make a duplicate if I were you. It's nice that you have a picture. Wow! Beautiful! Some swappy partner got themselves quite a treat. Lovely. I've never worked with wool in a quilt before. It think I may try it. Thanks for posting your quilt for us all the enjoy. Que maravilla de trabajo, es una preciosidad!!! I had an idea the other day for a framed project for my sons' bathroom and this encourages me to do it! This is brill. I love all the little details! This is absolutely gorgeous! Such beautiful work in gorgeous wools. Thanks for sharing the process and the original photo. Love it! I love this picture and the quilt you selected. Great choices. This is really great. Love it. Love the bird houses, and the original picture is delightful. Your interpretation of it is wonderful. Great job! So cute I don't know how you could give it away! Your quilt is adorable! I love the colors and whimsical feel, it's such a cheerful quilt. Wonderful job for your first wool application.